Combining brilliant music with interactive comedy, Alex Horne and The Horne Section is unlike any other entertainment package. 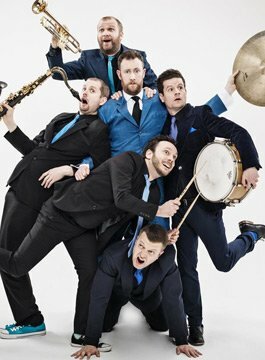 Award-winning comedian Alex Horne has gathered five of the most renowned jazz musicians in the country to create something fresh and funny. Its jazz-infused comedy, live and loud, part improvised, part honed, part performance, part party. The show is extremely versatile. Clients could opt for a straight half-hour show of comedy and music for after a meal or a longer set tailored to their evening. Alternatively, the band can provide fantastic live music throughout the evening; gentle jazz earlier and more upbeat later, with Alex acting more as a genial MC or The Horne Section can provide a full bill of comedy, with other great comedians combining with the musicians in new and exciting ways.